(d) The "Equipment" means all the equipment and accessories supplied to the Hirer. 1. This Agreement contains the complete terms and conditions of use that apply to you in joining, hiring and all other activities you will make with the owner. You agree to be bound by its terms and conditions of use and shall comply thereof. Amendments to this agreement can be made and effected by us from time to time without specific notice to you. Agreement posted on the Site reflects the latest agreement and you should carefully review the same before you join or hire from us. (a) Not remove the Equipment from the location designated on the invoice without the Owner’s written permission. (b) Comply with any written or verbal instructions given to the Hirer or accompanying the Equipment. (c) Hire the Equipment at its own risk, and bear responsibility for the Equipment hired from the time of its delivery into the possession of the Hirer until collection by or returned to the Owner. (d) Not sub-hire any equipment unless authorised by the owner. (e) Ensure all Equipment is returned or ready for collection by the Owner’s driver, in a clean, dry and properly packed condition and if being collected, is readily accessible. (g) Be responsible for obtaining the necessary permits and/or plans and pay such fees as may be required to use the Equipment. (h) Assume the risk of and indemnify and hold the Owner harmless from and against any and all property damage and personal injury resulting from: (i) the use of the Equipment; (ii) contact with underground cables, pipes, services or other obstructions; and (iii) all necessary surface repairs. 3. For the safety of our staff and to adhere to health and hygiene regulations all hired items must be cleaned of food and beverages. 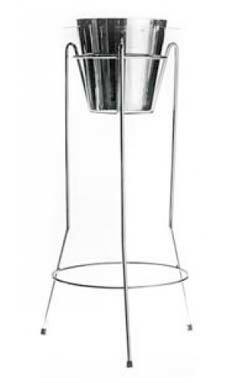 This includes but is not limited to cutlery, crockery, glassware, catering supplies and any other catering equipment. 4. Please do not use coloured paper napkins or wax candles on the linen, as it will stain. Please do not throw confetti near the Americana or Princess Chairs, as it will stain. 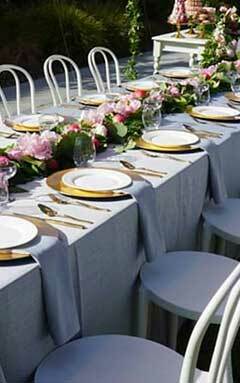 All linen must be clean from loose food, dust, decorations, confetti, glitter etc. 5. The Owner has the sole discretion to provide the terms of payment. Unless otherwise agreed, A 50% deposit must first be received by the Owner prior to confirmation and acceptance of an order. 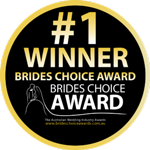 By paying a deposit you are agreeing to Betta Event Hire's Terms and Conditions. Unless credit terms have been agreed upon, payment for the products shall be made by credit card, PayPal or EFT. (a) Invoices are due and payable 14 days prior to the event date. (b) An order may be invoiced separately. (c) The Owner has all the discretion to cancel or deny orders. (d) The Owner is not responsible for pricing, typographical, or other errors in any offer by the Site and reserves the right to cancel any orders arising from such errors. (e) Amount quoted is in Australian dollars (AUD) and is for the noted hiring term only. (f) You agree that all charges for hire loss, hire extension, damage and repair will be paid and that all collection fees, legal fees or any expenses involved in the collection of these charges will be borne by the Hirer. (g) Prices quoted do not include Additional Services including but not limited to furniture set-up or relocation, design/concept developments such as CAD drawings and floor plans. Additional Services are available upon request and incur additional charges. 6. The 7% damage waiver (excluding GST) is payable by You to cover all costs associated with normal wear and tear to the Equipment and any accidental damage to a particular item of Equipment, provided that the replacement cost and/or cost of repairs to any Equipment which was damaged does not exceed 10% of the hiring fee for the particular item. (c) Damage to, or loss of, the Equipment from any unknown cause. (e) Failure to return the hired equipment by the return date unless an extension has been approved by the owner. (f) Damage resulting from not properly drying, cleaning and/or packing the Equipment. (g) Glassware breakage of up to 4 glasses, additional glasses are $3.00 per glass. (h) Any non-removable stains on items will be charged for the cost of replacement. 7. Cancellation of orders or products will forfeit all booking deposits. 8. The Hirer is responsible for the Equipment from the time of delivery or Hirer pick-up until collection by the Owner or return by the Hirer and shall pay for all Equipment damage or loss however caused during that period. The Hirer shall protect the Equipment from the elements from the time of delivery, use, storage or waiting period before collection. The Hirer shall maintain at its expense liability, property and casualty insurance coverage in amount necessary to fully protect the Owner and its Equipment against all claims, loss or damage of whatever nature or type. The Owner shall not be liable for any loss or damage caused to any person, property, animal or things whatsoever arising from the use of the Equipment hereby hired and the Hirer indemnifies the Owner in respect to any claims for such loss or damage. 9. The Owner's count and/or decision as to condition of the Equipment prior to dispatch and on return shall be final. 10. The Hirer grants the Owner access at all times to inspect or repair the Equipment and in the case of default to remove the Equipment. The Hirer shall on no account attempt to repair the Equipment but notify the Owner immediately in case of breakdown or failure. 11. The Hirer agrees not to use the Equipment at locations or purposes different to the Equipment's general designated purpose and specified suitability, such as indoor vs. outdoor use. The Hirer acknowledges responsibility for the Equipment and is liable for any damage. 12. Where the Hirer is more than one person liability shall be joint and several. 13. The Owner reserves the right to take photos at event locations utilising the Owner's equipment. Photos are taken with a focus on the Equipment and are selected with due care to exclude recognizable private property and persons. Photos may be used in publications or other media produced, used, or contracted by the Owner. 14. 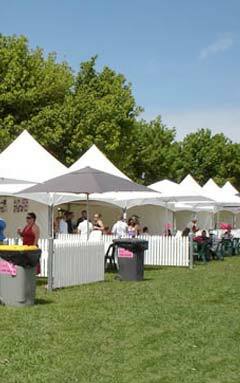 Betta Event Hire offers both delivery and collection of hired goods. Some products are delivery only and fees apply. These fees are based on the distance travelled and the weight of the order on the delivery vehicle. 15. Hired equipment can be collected from the office between 9:30am-4:30pm Monday-Friday. 16. Delivery charges quoted are based on a non-specific time between 8:00am – 5:00pm. A surcharge or after hours charge may apply for specific delivery times. 17. Furniture setup is NOT included in our hire rates. Should you require furniture set up – please contact the owner. 18. The Hirer is responsible for having someone available to accept the delivery and upon collection. 19. Failed collection attempts will result in an additional collection fee. 20. Hire rates cover hire over a twenty-four hours’ period or part thereof. Failure to have items ready for collection or returned on the agreed date will incur a late charge fee. 21. Your continued use of the Site and following the posting of changes to these Terms and Conditions of Use will be deemed your acceptance of those changes.